Gina… the face of LA’s UNDRGRND Wave, Cali raised, real thorough and from the streets of LA. Bold, blunt, and feisty, are all things that make Gina who she is. The vibe and aesthetic of the 90’s era influenced her mission, and fuels her drive to give back to the music culture today. The G in Gxpo stands for Gina and Xpo represents Exposure. Whats it like growing up where your from? I got into music because I wanted to recreate the feeling I felt everyday coming home from school watching 106 and Park on BET. Since I was a child, my career goal was to be the next host of 106 and Park or a new show like it. It’s unfortunate that a show which helped shape the culture, is now only a memory. I built my own brand to bring the feeling back, to create new memories, and to bring light to undiscovered artist. I want my generation to be able to look back at these moments in hip hop history. 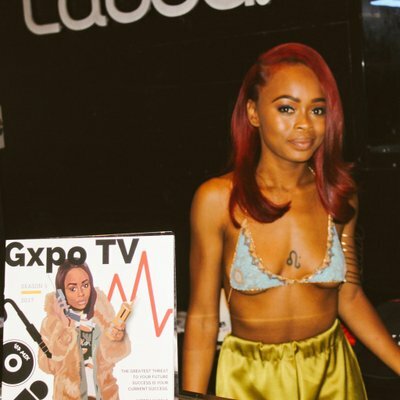 I created Gxpo TV because there isn’t a consistent platform in LA showcasing talented artist. Currently, I’m gearing up for Season 6. I can’t say to much because it’s a surprise but what I can say is that I want the viewers to be more involved this season. Once a month, Gxpo TV does a countdown of the hottest visuals released, “Squeez 10”. The viewers vote on their favorite video to be the #1 Squeez.